On Thursday 23rd April 2015, Oxford Brookes welcomed back some of its esteemed alumni who were celebrating ten-years since completing their Physiotherapy degree back in 2005. 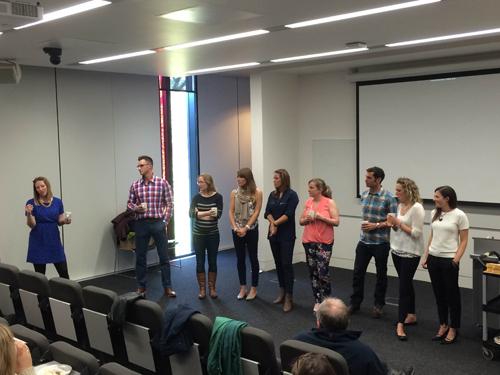 The event, hosted by the Department of Sport and Health Sciences at Oxford Brookes, and with help from the Alumni Office, saw nine members of the ‘Class of 2005’ cohort return to Brookes and give invaluable careers advice to current Physiotherapy students. With a number of department staff also present, there was much opportunity for reminiscing as the alumni were reunited with their former academics. Laura Smith ‘05, who first suggested the idea of a reunion, introduced the event alongside current Head of Department Dr Carolyn Mason, before herself and three of her fellow alumni gave formal presentations to the students. The audience listened intently as Adam Brett ‘05, Susie Calvert ‘05, Teresa Devitt ‘05 and Laura herself all entertained and inspired with tales of their careers and experiences since graduating a decade ago. Each had their own nuggets of advice to share, and a time for networking followed where students were offered further guidance and anecdotes over tea and cake. As the event drew to a close, there was just enough time for the guests to be led on a tour of the new John Henry Brookes Building, which naturally encouraged more reminiscing about how much the university has changed since their departure. 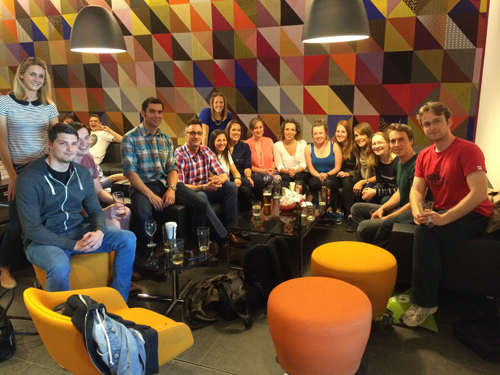 The tour conveniently ended in the SU Bar, where the Class of 2005 joined current staff and students for a drink, before heading off into Oxford for the evening. Dr Carolyn Mason described the event as “a lovely, inspirational and in truth emotional afternoon. Hopefully we will not have to wait another ten years for a similar event to take place, and that reunions such as this will now become a regular addition to the Department’s annual calendar!" A big thanks must go to Dr Carolyn Mason and the department, as well as alumna Laura Smith, for their efforts in organising this event.